France and Germany – political and economic powerhouses of Europe – have rewritten the terms of their long-term engagement to increase bilateral cooperation, offering a promise of long-term peace and stability on the continent. However, it might have the opposite effect. 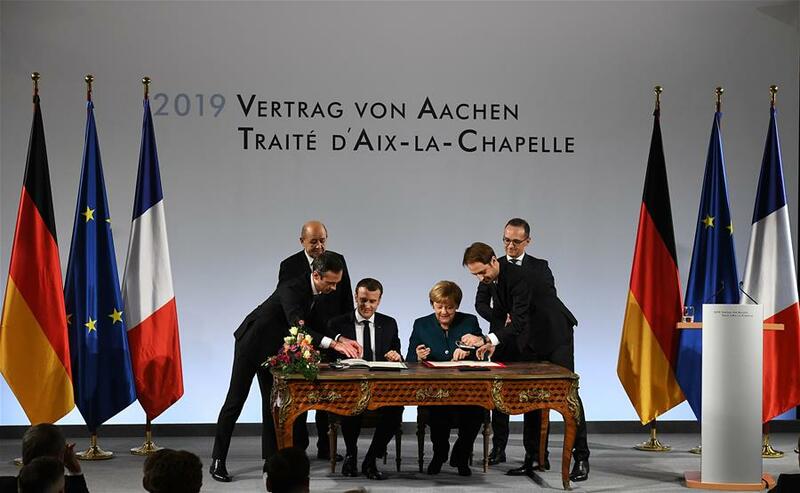 President Emmanuel Macron and Chancellor Angela Merkel signed their landmark agreement on January 22 in the city of Aachen, 56 years after their predecessors inked the historic Elysee Treaty establishing the contours of post-war reconciliation between the erstwhile rivals. The 16-page document details cooperation in various diverse fields such as defense, foreign policy, climate, politics, culture, economy and business. The venue chosen for making the agreement is highly symbolic. Aachen was the capital of King Charlemagne, famous ruler in the 8th and 9th centuries credited with uniting Europe by establishing an empire consisting of most of the territory of the six countries, including France and Germany, that became founding members of the EU. Like the venue, the timing is crucial. The agreement cements closer Franco-German cooperation and their position within EU at a time when the U.K. is embroiled in an intense political struggle to leave the union. The agreement primarily covers bilateral matters, yet it also creates a platform to considerably impact wider EU policies. Given the fact that the two countries fought three wars against each other in less than a century, security and foreign policy naturally are priority areas. They pledged to provide "aid and assistance by all means at their disposal, including armed forces, in case of aggression against their territory." A Franco-German Defense and Security Council is to be established to provide guidance and direction in this regard. Economic and commercial ties have also been given special place and the two sides agreed to set up a Franco-German economic zone with common rules. They also agreed to harmonize the rules related to doing business. The third tier of agreement is about diplomatic relations. France will make efforts for Germany’s permanent membership of the UN Security Council. The two countries will also work for unified EU stand on various issues that come before the world body. The fourth tier is related to people-to-people contacts. It provides for promotion of facilities on both sides of the border so that people and business entities can easily move to and fro. The agreement is seen as a sheet-anchor in a turbulent 21st century to keep Franco-German ties on an even keel, and strengthen the European integration project. However, far-right parties on both sides of the border, and detractors within the EU, are crying foul and branding the agreement as being a disservice to their respective people. There are claims that the agreement will erode sovereignty. Both French and German right-wing politicians allege that the agreement will compromise national freedom by giving each other too much say in the affairs of the other. The objection is somewhat outdated. The traditional idea of sovereignty is losing its sheen. And the concept of absolute freedom of action has changed in the presence of hundreds of bilateral, regional and international bodies that keep a check on the sovereign powers. However, those claiming that Germany and France are creating a "Super EU" are partly right. This is countered by an argument that, even without Aachen agreement, the two countries are strong enough to influence EU politics. Also, there is no secret that both Merkel and Macron want to strengthen European ability to become less dependent for security on the U.S. and NATO. Overall, however, the Aachen treaty is good to the extent that it will further integrate the policies of France and Germany and reduce chances of friction between them that would be widely damaging. Yet, any effort to dictate to the rest of Europe, or build some kind of European security union by sidelining the U.S. or U.K., could actually further divide and weaken the continent.